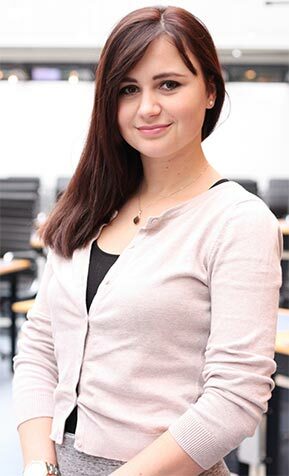 After a successful research period at Wittenborg University of Applied Sciences, the institute has appointed Kriszta Rostás as its new education and quality support officer, thereby investing more resources in quality improvements. Kriszta, who is Hungarian, has a Master degree in Economics & Business from the University of Utrecht. She grew up in Romania and speaks four languages: English, Dutch, Romanian and Hungarian. Kriszta is the latest addition to Wittenborg’s already multicultural staff members with almost 20 different nationalities between them. She located permanently to the Netherlands in 2013 after partaking in a student exchange programme. Before joining Wittenborg as a researcher in January assessing the quality of its exams, she worked as a research co-worker at Windesheim University of Applied Sciences in Zwolle and at a Dutch SME helping companies in developing countries. As of August she has been appointed as education and quality support officer at Wittenborg, making sure the university not only adheres to set academic standards but also improves it to the extent of becoming a leader in the market. She loves living in the Netherlands, especially the relaxed attitude of its inhabitants. “Before, living in Romania, I saw myself as someone who has a nervous energy. Here I am more relaxed.” Outside of work she likes cooking, swimming and used to be a Hungarian folk dancer.